Meningitis outbreak: What i actually said – Gov. Yari – Royal Times of Nigeria. 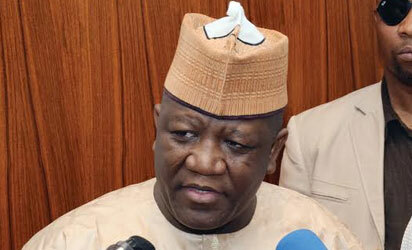 Zamfara Governor, Dr. Abdulaziz Yari Abubakar on Wednesday, said he never attributed the outbreak of the deadly Cerebral Spinal Meningitis which has killed over 300 Nigerians to God’s punishment arising from fornication and other forms of disobedience to God. Speaking through his Special Adviser on Media and Public Enlightenment, Mr. Ibrahim Magaji Dosara in a statement made available which reads; “The Governor noted that the situation was unfortunate because the state does not have enough vaccines yet for the Type C Meningitis. “The governor thereafter enjoined all Nigerians to embrace prayers, as God who is aware of the outbreak of the ailment surely has the antidote for it. “The Governor specially appealed to Nigerians to make a deliberate effort to be closer to God by shunning sins of fornication and other forms of disobedience so as to receive his divine health and other blessings, as he is closer to those who obey him and distant themselves from sins. However, the governor who spoke in Hausa had a particular audience in mind when he spoke to the BBC Hausa reporter. “Let it be known too that the governor still insists that all diseases come from Allah and that at no point in his interaction with the reporters did he insinuate that Allah was punishing Nigerians but instead drew from the teachings of great Islamic traditions to buttress the point he was trying to convey. “This is exactly what the Governor said. But because some people are out there to ridicule him at the slightest opportunity and make a mountain out of a molehill with a view to tarnishing his rising reputation, the innocuous statement was misinterpreted and quoted out of context for reasons best known to the authors. “We, therefore, use this medium to appeal to all well-meaning Nigerians to ignore the story making the round and condemn the act of unethical practice by those disseminating the deceptive story. “For the avoidance of doubt, the Zamfara State Government in conjunction with relevant federal government agencies is making frantic effort to contain the outbreak of meningitis in the state by taking immediate steps to secure appropriate vaccines for the latest health challenge. “Let it be on record that the state under the leadership of Governor, Abdulaziz Abubakar Yari will not abandon the wellbeing of the people, who elected him to pilot the affairs of the state for any other thing. “As the saying goes, health is wealth, and the administration will not settle for anything apart from vigorously pursuing the overall well-being of Zamfara people,”.